Josh Carey joined Allan McMinigal as Westfield's leading scorer this season after netting his 11th goal of the campaign in the defeat to Alfold. 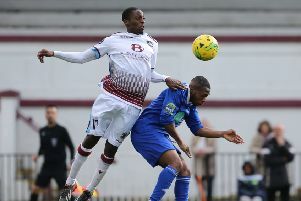 Westfield Football Club’s five-match winning run was ended by the new league leaders on Saturday. The Westies saw a half time lead overturned as they lost 2-1 at home to Alfold in Macron Store Southern Combination League Division Two. Westfield joint manager Jack Stapley said: “We were beaten by a better side on the day, as simple as that. I would say they’re the best side we’ve played this season based on that performance. “Unusually for us, we just didn’t do enough going forward. We didn’t hold the ball up very well and apart from the goal, I don’t think we had a shot on target. Westfield took the lead against the run of play after 15 minutes. The home side won the ball from an Alfold goal kick and Jacob Shelton slipped it through for Josh Carey to slot past the goalkeeper. Westfield defended very well to preserve their advantage through to half time. Although they came under a lot of pressure, Westfield’s tall back four dealt with everything in the air and Bourne claimed a few balls into the box too. As the game wore on, though, it became clear that Alfold would break Westfield down at some point. The visitors played out from the back and with Westfield giving them too much time in midfield, they enjoyed a lot of possession in good areas. Alfold equalised when the in-form Daniel Hallett got in between Scott Ramsay and Jake Adams to guide a header into the net via the inside of the post. The visitors’ winning goal was similar to their equaliser. A lovely ball in, this time from the opposite flank, was powered home by big centre-forward Thomas Familton from eight yards. Westfield had one half-chance after that when Ramsay headed over from a corner, but over the 90 minutes Alfold had the lion’s share of possession and half-chances and Bourne pulled off some good saves. Westfield: Bourne; Stapley, Adams, Ramsay, Gravett; Ward, McMinigal, Barrett; Shelton, Carey (Agun), Grindle.